Josh Peckler - Jpeckler@shawmedia.com A competitor in the tracker pull event moves through the course during the Mchenry County Fair in Woodstock Saturday, August 4, 2012. Josh Peckler - Jpeckler@shawmedia.com Bryce Lalor of Union holds onto his sheep while sitting on a fence before he takes it to the 4-H auction during the Mchenry County Fair in Woodstock Saturday, August 4, 2012. 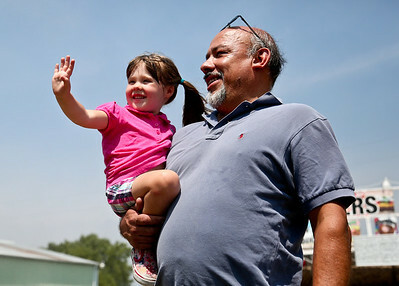 Josh Peckler - Jpeckler@shawmedia.com Rebbekah, 3 and Ben Morrow of Island Lake cool off in front of a misting fan during the Mchenry County Fair in Woodstock Saturday, August 4, 2012. 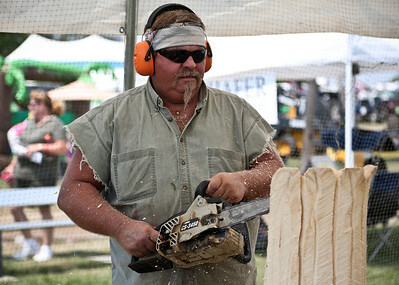 Josh Peckler - Jpeckler@shawmedia.com Don Johnson of Alton uses a chain saw to make wood carvings during the Mchenry County Fair in Woodstock Saturday, August 4, 2012. Josh Peckler - Jpeckler@shawmedia.com Lori Dwyer of Mchenry (right) is helped by Ryan Sheehan of Huntley as she milks a cow during the Mchenry County Fair in Woodstock Saturday, August 4, 2012. 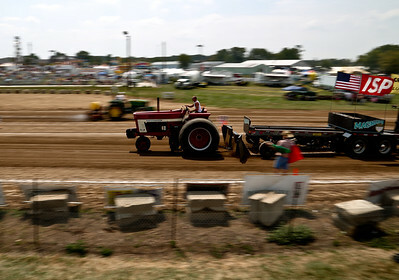 A competitor in the tracker pull event moves through the course during the Mchenry County Fair in Woodstock Saturday, August 4, 2012.